This Christmas season has been a busy one at the farm with critter antics and adventures galore. Stories are coming, but we wanted to wish all of our farm fans a very merry Christmas with our version of Twas the Night Before Christmas, farm style of course. We hope you enjoy. God bless! Every creature was stirring, making one noisy barn. Ranger hoped they’d be filled with carrots to share. Wiping visions of sleep right out of our heads. Decided rest was not coming. Nope. Nope. Nope. We dashed in to see what could be the matter. Nightmare the cat had cornered a mouse. Oh dear me, not another. When will we build a house? Water troughs glistened like new fallen snow. Jack rabbits, turkeys, and all sizes of deer. Cowboy chimed in, “No ma’am, not one more for you. These critters are guests, and they’re just passing through. I smiled and I nodded, a wink in my eye. I realize he’s right, I cannot tell a lie. Even when dogs chew shoes and horses bust stalls. “Now Dixie! Now Goober! Now Maybelle and Shadow! Oh Willie! Oh Grizzly! Oh Chip, Bear, and Rhino. Nighttime is ending, please Santa don’t miss us. We begged and we pleaded, “For once settle down. Christmas is coming, and Santa is near. Set out their buckets, while we found the manger. As we looked to the sky, soon it would be Christmas day. Peace and rest came in the sound of sweet snores. I peeked out the window to find it was snowing. Just at the moment, I saw old Saint Nick. He was chubby, and jolly and ever so quick. I jostled poor Cowboy so he wouldn’t miss it. Santa bent down, his hat to his chest. Asking the Lord to meet all of our needs. They joined dear old Santa, with heads all bowed down. Reminded us why our Christ was born. To love every person, even Cowboy and me. Jesus has blessed us with our own little zoo. 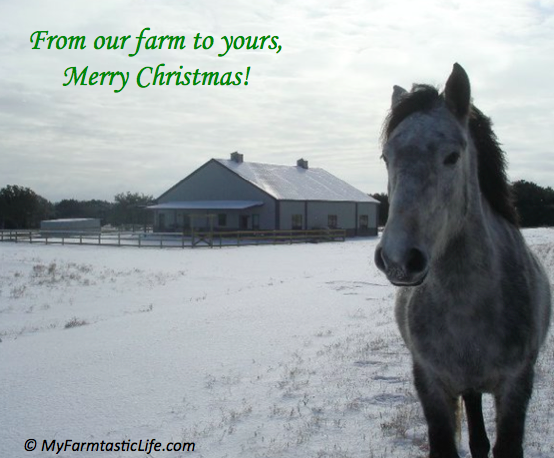 So from our farm to yours, we offer this wish. From people to donkeys, to dogs, even fish. We pray this New Year will bring blessings to all. Merry Christmas, happy holidays, and a Texas yeehaw!